For more than four decades Jack Wilkins has played an important role in the New York jazz community. His list of credentials and past performances reads like Who’s Who of Jazz. Over the years he has backed many of finest jazz singers from Mel Torme, Ray Charles, Morgana King, Sarah Vaughan, Tony Bennett, to the Manhattan Transfer, Nancy Marano, Stanley Turrentine and Jay Clayton. Most recently, Wilkins has shared the stage with jazz greats: Jimmy Heath, The Mingus Epitaph and jazz bassist Eddie Gomez. Born in Brooklyn, NY, Jack began playing the guitar at the early age of ten. His childhood idols included Django Reinhardt, Charlie Christian, Wes Montgomery, Bill Evans, Clifford Brown, Freddie Hubbard and Johnny Smith. In 1973, at the age of 29, Jack recorded his first album as a leader. Since then he has recorded numerous projects on many different labels. 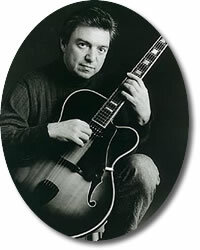 Besides his extensive recording and performing career, Jack Wilkins has written several books and recently was featured in a live concert DVD with his friend and fellow jazz guitarist, Jimmy Bruno entitled Jimmy Bruno and Jack Wilkins: Live from The Theatre in Washington, Virginia presented by The Benedetto Players. Jack Wilkins has been awarded an NEA grant in recognition of his artistic achievement and contributions to guitar. He was invited to the Smithsonian Institution to take part in the "Blue Guitars" exhibit, and appeared on the P.S. I. first live jazz Internet concert. He was also featured as part of the J.V.C. New York festival tribute to Johnny Smith, Tal Farlow and Herb Ellis and Barney Kessel. Jack Wilkins teaches at The New School and Manhattan School of Music and frequently conducts seminars and guitar clinics, both in New York and abroad. Virtuoso jazz guitarist Jack Wilkins teaches single note improvised soloing over 2-5-1 progressions through the circle of 5ths while introducing arpeggios that fit this important progression. On-screen numbers help correlate the numerous examples with monologue and performance. The tritone substitution is also thoroughly explained and demonstrated. Jack then introduces 5 basic arpeggios: major 7, minor 7, dominant 7, minor half-diminished, and diminished. The powerful concept of contrary motion - bass line versus melody is explained for use in chord melody soloing. The Dorian mode and scales in general are also taught with Jack playing with a pick, pick and fingers together, and fingerstyle! The booklet download for this DVD is detailed and very helpful. Includes an incredible solo guitar rendition of "Here's That Rainy Day" in chord melody style! Jack Wilkins Plays "Here's That Rainy Day"
Jack's skills as a session player, jazz player and all around guitar virtuoso have been honed by playing countless gigs and recording sessions. This book compiles many of Jack's lessons originally written for "Just Jazz Guitar" magazine. Subjects include comping, harmonization and single-note soloing in the jazz setting, learning how to practice, using your left-hand thumb for chording, inner voices, intros, endings, tri-tone substitution, 6 basic fingerings, altered scales, picking, arpeggio extensions, approach notes and intros to 4 solos (Mel's Blues, Speak Low for Me, Stella's Moonlight, All The Things). Jack Wilkins Plays "Someday My Prince Will Come"